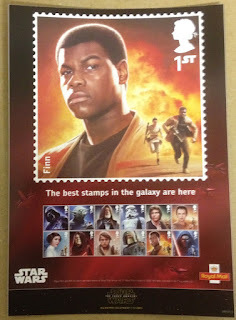 Just an attempt to push as many Star Wars stamps as possible to pay for the exorbitant royalty fees they will have had to pay the studio/producers? If it's a success, will US Mail make a hostile bid for Royal Mail just like Kraft Foods and Cadbury...? I for one will not be buying these. At the end of the day they are commemoratives and not worth their face value. Actually, they are worth their face value! I'm fairly sure the Royal Mail will sell them, but why on earth are they doing this? This was mentioned in a comment on an earlier post, and is also noted on our webpage(http://www.norphil.co.uk/2015/10a_Star_Wars_Stamps.htm). It probably isn't mentioned in any of he blog posts but there are a lot of other products not mentioned either. I think Royal Mail are hoping to bring in a great deal of revenue from these products. £120.00 does seem a bit steep for a hologram cover, tin box and UV light. But as the edition is limited to 1,977 units (the year of the original film release) I'm sure it will not only sell-out but rapidly increase in value, as every PSB collector will need one for their collection. The rare 1969 Stamps for Cooks stapled edition now sells for 400 times its original face value. Due to an overwhelming demand for the Star Wars issue, there may be a slight delay in despatching your eBay order. We are working towards you receiving it by the end of this week, and apologise for any inconvenience this may cause. Just received my order of Star Wars out of 20 sheets received 11 are damaged, the bureau has become very bad in what they do, sending anything in the post to arrive safely and without creases because they do not use enough card stiffner and anything to stop items breaking and moving around in transport to the buyer. I will be sending some back. My packing back to them will be better than what they can do. I’ve found they use more stiffening with their eBay orders than those placed directly with Tallents House, though they do lump multiple sets in one carrier. I suppose it all comes down to their baseline costs. In terms of the publicity material, Truro had just the same A4 & A5 characters as above, plus a framed A1 (I think) of Rey and a stand up 2m or so high publicity board with the three stamps showing the characters from the new film. Didn't see anything in my local branch, but can confirm that as I expected they were back to Machins (but red ones) for 1st class stamps as of this morning. At a guess, the reason they are taking this approach rather than the eBay VeRO procedure, is that they could not meet eBay’s requirements. By taking this approach Royal Mail may well be in breach of eBay’s rules. Given the amount of material that is not destined for collectors, but ends up in our hands, Royal Mail are missing a revenue stream here. Indeed - sometimes they take their eye off the ball. While they are busy producing framed stamps and special packs for Star Wars collectors they have overlooked the fact that 'stamp' collectors collect things other than stamps. Given the amount of material not destined for collectors, it surprising just how much is in our hands. Some of it direct from Royal Mail. The Philatelic Bulleting gave away sets of sample books to readers, the posters advertising the new issues were often available at philatelic counters (well King Edwards Building & Trafalgar Square anyway) and some Post Shop Plus’. Wouldn’t Royal Mails efforts be better place tackling the leakage of blank Post & Go labels, which can pass through the system without a payment being made to Royal Mail? Ah, here we are again pointing the finger at those of us who collect the blank P & G labels - thanks to a friendly PO manager. Wouldn't Royal Mail Revenue Protection be MUCH better off tackling the hundreds of Ebayers who sell unfranked postage by the shed load. Just type in 'unfranked' and see how mnay listing there are. I tried just now and 22:40pm and there are 931. Yes 931 lots listed. So, how much is Royal Mail losing in a week ? The auction is ONLY available to Royal Mail employees.